My 1-2-3 Cents : Bah Humbug! There have been some pretty silly gimmicks over the years in the world of wrestling. We've seen wrestling clowns, garbage men, and plumbers. The holidays seem to spawn some weird gimmicks too. In fact, until I had started researching this subject, I had never heard of the man to your left, the Christmas Creature. But he did indeed exist. Here's the video link to prove it. Despite being dressed from head to toe like a Christmas tree wrapped in a candy cane, we all know the man under the mask. It's the big red monster, Kane! I can't find a whole lot of details about the gimmick, other than that video on YouTube. From the looks of things, the Christmas Creature wasn't around very long. He was part of the Memphis promotion USWA in 1992. The WWE would not be upstaged by the USWA in the battle for silliest Christmas gimmick. 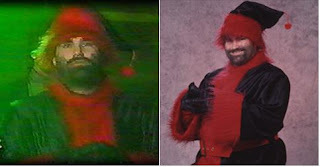 In 1995, Ted DiBiase introduced us to Xanta Claus. He was from the South Pole and wore a black suit with red trim. Xanta wasn't around very long though. I don't know if it's because the gimmick was so lame or if it was because Christmas had come and gone. Xanta would go on to become Balls Mahony, the former star of ECW. I actually met Balls several years back after a WWECW show in Poplar Bluff, Missouri. He signed my shirt in fact. As we've seen from Xanta Claus, the Christmas Creature, and even the Thanksgiving flop the Gobbledy Gooker just don't seem to work. They're fun (if you can call it that) at the moment, but just can't seem to get over with the fans. Of course now they're fun to look back on and laugh (or cry) depending on your attitude. And through the years, the WWE has dressed up different superstars and divas as Santa and his helpers. In fact, they have a couple of albums set up on the company's Facebook page.